A seat and plaque unveiled on the first anniversary of the bushfire that took a terrible toll on the street in 2013. 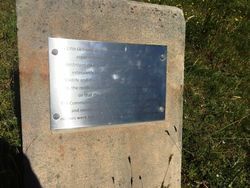 The plaque also pays tribute to the emergency services personnel and the community fire unit workers whose efforts ensured that no lives were lost, although nine houses were destroyed (seven in St Georges Parade and two others on the Darling Causeway). On October 17 2013, a 496 hectare fire ripped through Mount York Road, St Georges Parade and the Darling Causeway destroying as many as a dozen of the more than 20 homes on the street and numerous vehicles. 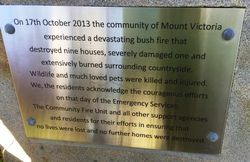 On 17th October 2013 the community of Mount Victoria experienced a devastating bush fire that destroyed nine houses, severley damaged one and extensively burnt surrounding countryside. 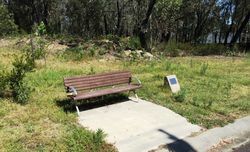 Wildlife and much loved pets were killed and injured. We, the residents acknowledge the courageous efforts of that day of the Emeregency Services, the Community Fire Unit and all other support agencies and residents for their efforts in ensuring that no lives were lost and no further homes were destroyed.